Production of the Audi A3 Sportback e-tron: Assembly – On the engine and component assembly line, the electric motor and transmission are fitted to the engine. Approximately 50 cars every day, with the same timing and on the same assembly line as the other models: Audi is now ramping up production of the Audi A3 Sportback e-tron*. The premium manufacturer is producing its first plug-in hybrid model at the brand's main plant in Ingolstadt. "We started series production of the Audi A3 Sportback e‑tron in the summer," said Dr. Hubert Waltl, Board of Management Member for Production at AUDI AG. "Most of the assembly work is integrated into the A3 line; no separate manufacturing is necessary. That demonstrates the flexibility and efficiency of our production planners and employees." With the Audi A3 Sportback e‑tron, Audi is launching the mobility of the future. The compact five‑door combines a 1.4 TFSI combustion engine with a 75 kW electric motor, resulting in a total system output of 150 kW (204 horsepower). Despite the sporty driving performance, fuel consumption in the NEDC is just 1.5 liters per 100 kilometers (35 grams of CO2 per kilometer). The A3 Sportback e‑tron can travel up to 50 kilometers in purely electric mode and up to 890 kilometers more with the gasoline engine. "We first of all ramped up production of the A3 Sportback e‑tron to about 30 cars a day in September," explained Board of Management member for Production Waltl. "Our peak is approximately 50 units each day now. In any case, we are keeping additional capacity available." Peter Kössler, head of the Ingolstadt plant, stated: "Working with high‑voltage systems in series production was a new challenge for us, but we mastered it well. At all stages of assembly, we achieve maximum levels of safety for our employees and quality for our customers." Safety is given top priority during the entire assembly process. 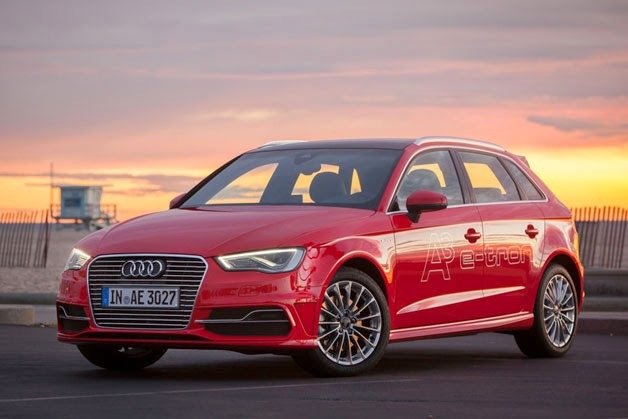 All the employees who come into contact with the A3 Sportback e‑tron have received technical safety instructions for the new technology; some employee who are directly involved are qualified as specialist electricians for automotive technology.